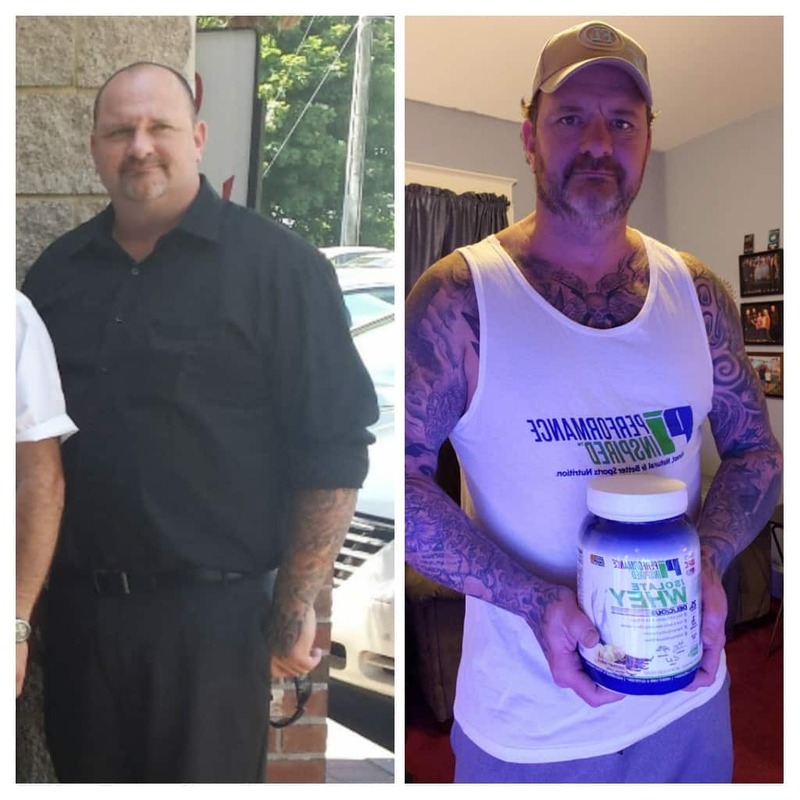 The picture on the left is me at 46 years old in 2015 at 6’3″ and 296 lbs. My blood pressure and cholesterol levels were pretty high. Being a construction worker, I was active, but not actively exercising or considering what I was eating. In early 2016 I began to train at a gym I haven’t been to in years. I got back into a pretty good training regime with a 3 days on, 1 day off schedule. I also started to watch what I was eating. In the fall of 2016 I took it up a notch and had a pretty good meal plan going on with low carbs and high protein. I began with the Performance Inspired supplement product line. I started with the Pre-Workout for getting a jump on my training without “the jitters”. This is why I’ve enjoyed PI’s Pre-Workout. I was also using the Performance Whey as a post-workout shake to get me an additional 25 grams of Protein. The next few months incorporated the Pure Micronized Creatine to assist in supporting lean body mass. As PI developed and offered Protein products, I followed up with their Ripped Whey, and now currently use Isolate Whey. As 2019 kicks off with me being 49 years old, I’m holding steady at 240-244 lbs. So, with the loss of around 54 lbs., my cholesterol and blood pressure is much better. My job as a Union Sheetmetal worker has also become physically easier. I haven’t been in this good of health since I was a U.S. Marine in the 1990s! I plan to keep on with my meal plans, weight training with cardio, and Performance Inspired protein products. I more recently have enjoyed Performance Inspired’s new team member Dr. Jena Gates for her self-help exercise videos. They are highly relatable for the treatment of common muscle fatigue. Also, Performance Inspired’s team offers much motivation via blogs, Twitter and YouTube videos from founders Mark Wahlberg and Tom Dowd. Thank you for setting your supplement products company apart from the rest!